Buying a brand new commercial dishwasher, whether for a restaurant, cafeteria or any other institution, is one of the most serious commercial kitchen purchases you’ll ever make. For that very reason, you’ll need to know about the different types available on the market, and what type of establishment they’re most suitable for. With that said, asses the unique needs of your business before settling for an industrial kitchen dishwasher in order to make sure you will make the right purchase. The most important factors to consider are the internal capacity and external dimensions. And unless you’re designing and equipping a kitchen from scratch, you’ll most likely have to measure the available space you have and find an industrial kitchen dishwasher that fits right in. Most dishwashers are front-loaded cabinets or under-counter models, and they’re typically placed under work surfaces. Most models also open with a drop-down door, meaning you’ll have to leave enough room for loading and unloading trays and free movement of service staff. Then, you have to consider whether you want a high or a low-temperature dishwasher. High-temperature dishwashers use high heat to sanitize dishes and glassware. However, in order to do that they use more energy, but they don’t require the use of extra chemicals for sanitation. That being said, they also have the benefit of being harmless to the glassware, dishes, and flatware due to the lack of chemical solvents. Furthermore, high-temperature dishwashers dry the dishes effectively by flash drying them at the end of the washing cycle. All of these benefits, of course, come at the price of a higher initial cost. Low-temperature dishwashers, on the other hand, use a chemical bath to sanitize and clean dishes and glassware. And while this method is less effective when cleaning grease laden dishware, the cost of operating this type of units is lower because heating costs are reduced, but the dishes may have to be rewashed frequently to be clean, which means you’re going to use more water and electricity. Additionally, the chemical solvents may corrode stainless steel, glass, and pipes and may leave a residual taste. As you can see, efficiency is a big deal when deciding between different models and types. With that said, don’t settle for units that aren’t Energy Star rated. Energy Star rated dishwashers take advantage of energy efficient features to save on electricity and water. 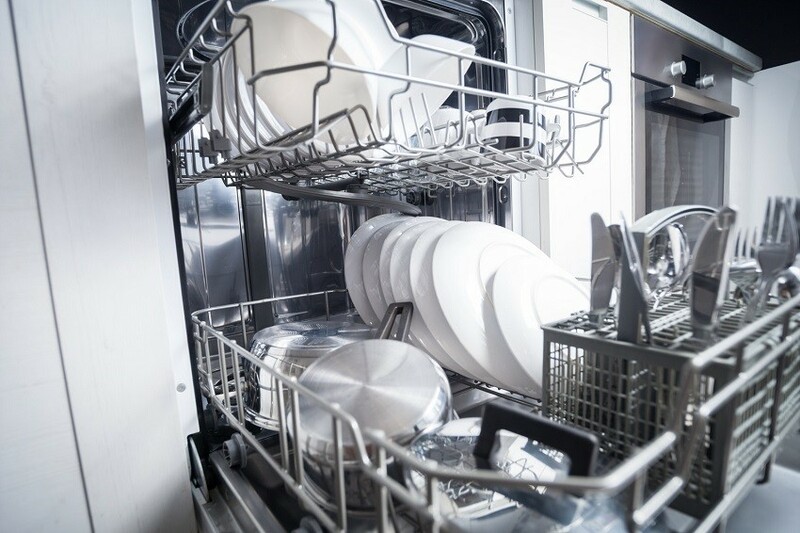 Things like automatic filling, idle pump shutoff, and built-in booster heating can go a long way to improve the energy efficiency of a dishwasher.